Image: the entrance of the big Ofnet cave. Location: 4,5km southwest Nörlingen. A7 exit Heidenheim, towards Nördlingen through Neresheim, Nattheim. At the quarry/Roman villa 5km before Nördlingen turn left. Park at Roman villa. 15min walk. 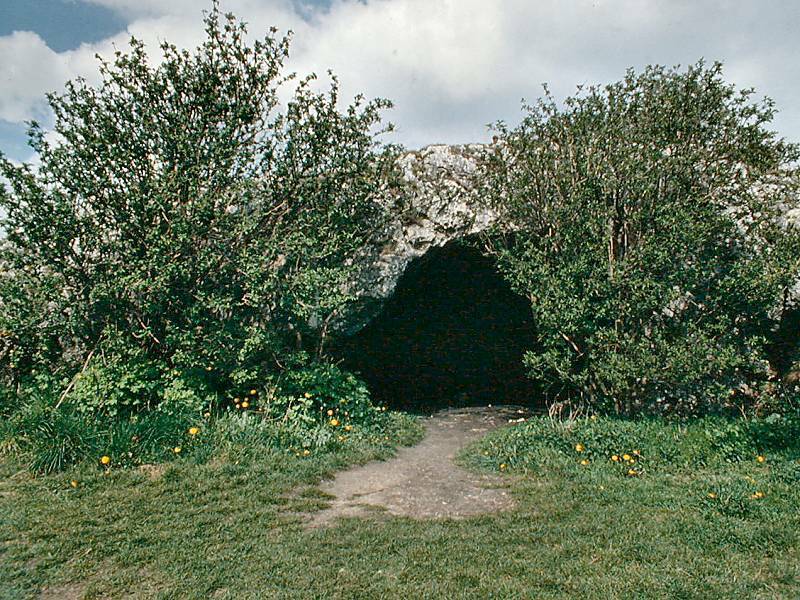 Classification: Karst cave, Limestone cave, archaeological site. Dimension: Big Ofnet: A=520m asl, L=30m, portal: W=6m, H=4m. Small Ofnet: A=525m asl, L=15m, portal: W=4m, H=2.70m. Image: the Small Ofnet from inside. 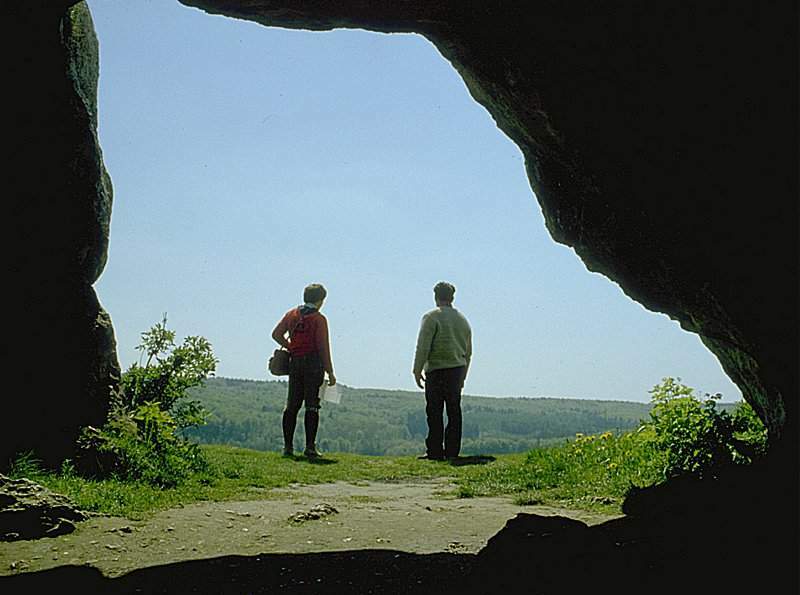 The Ofnet Caves are located near Nördlingen in the outer side of the rim of the Nördlinger Ries meteor crater. 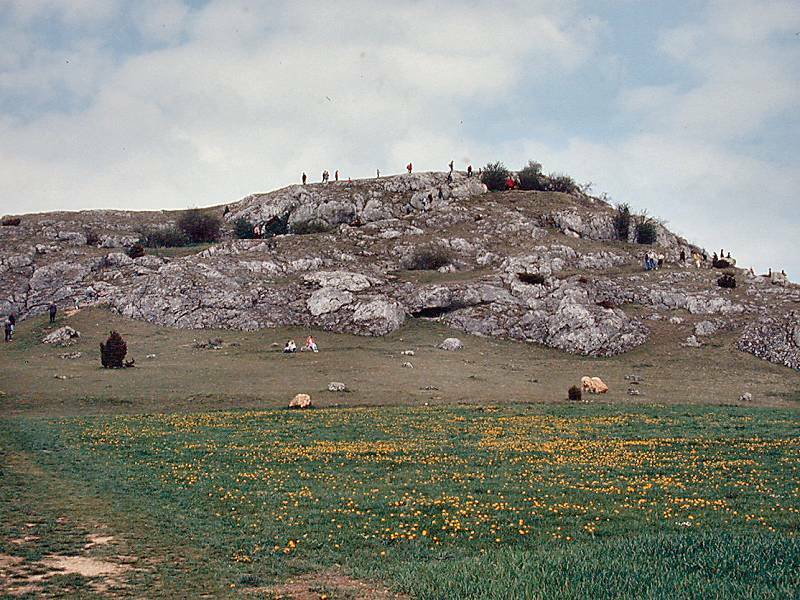 It seems necessary to first explain a bit about this extraordinary geologic site first, as it influenced the caves very much. 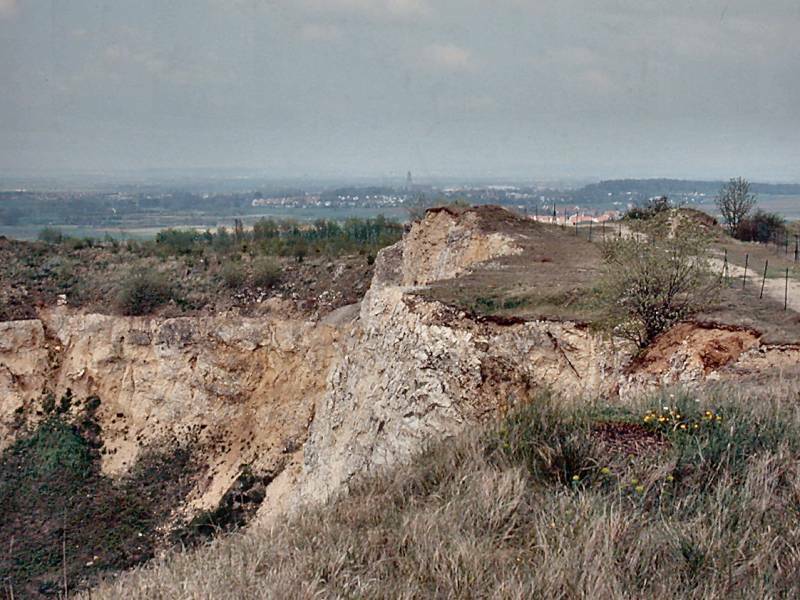 The Nördlinger Ries is one of the biggest meteor craters of the world with an diameter between 24 and 25km. It was formed by the impact of a stone meteorite about 14,7 Ma ago in the Upper Miocene. In the following, times, with a very warm, subtropical climate, the crater was filled with a lake and during millions of years it was completely filled with sweet water lake sediments. Later the upper layers were eroded by the melting water of the Ice Age glaciers, and so the crater is again visible as a bowl today. The sediments inside the crater are much younger than around and full of fissils. Nördlingen is located inside the crater, on a fertile plain. More informations about the meteor crater can be found at the Rieskrater Museum in Nördlingen (Hintere Gerbergasse 3, Tel: +49-9081-84143). 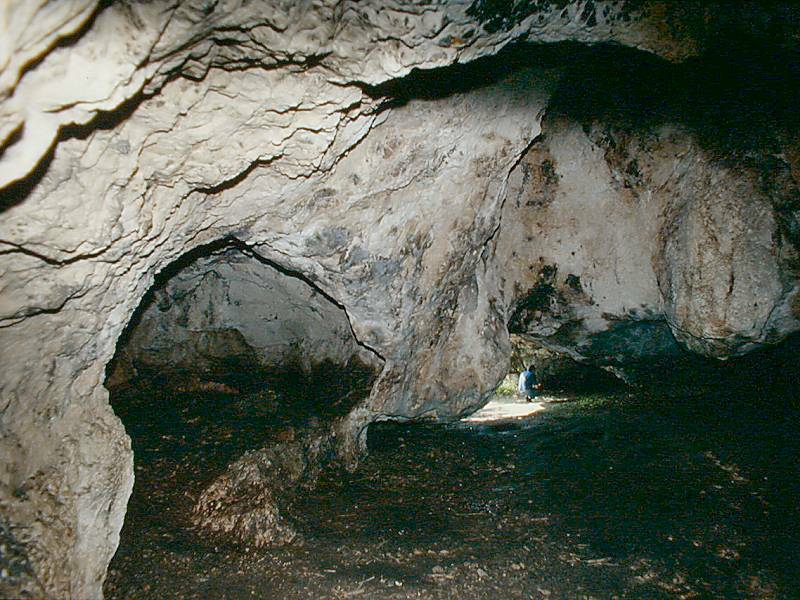 The Ofnet caves formed inside the crater wall. This caves are accessible for a long time, opened by the now dry valley in front of the crater. 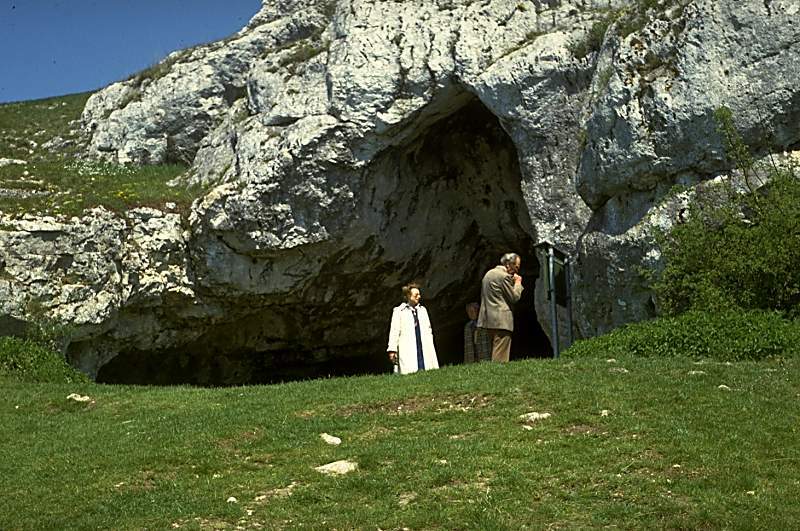 There are two small caves called Große Ofnet (Big Ofnet) and Kleine Ofnet (Small Ofnet). 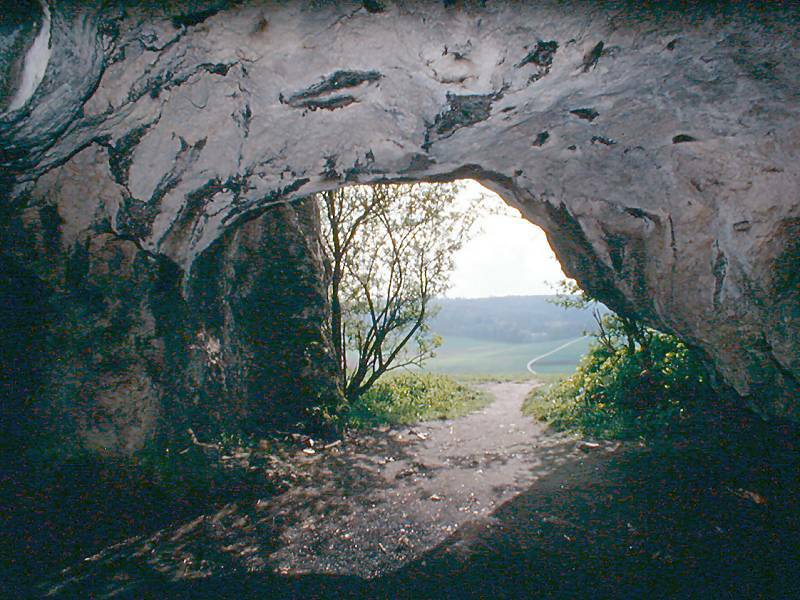 Both caves were used by Stone Age man from the Moustérien to the Magdalénien and during the Mesolithic. From the Mesolithic are the Die Ofnethöhlen waren bereits in mittlerer Altsteinzeit (Mittelpaläolithikum, 40.000 a) bewohnt. Bei Ausgrabungen wurden 33 Menschenschädel und Grabbeigaben gefunden: 4000 gelochte Schnecken, 200 durchbohrte Hirschzähne (Schmuck?). Besonders spektakulär wren die Funde der Schädel, die in Nestern angeordnet waren. Unverheilte Schädelverletzungen lassen auf gewaltsamen Tod schließen. Ob es Opfer des eigenen Stammes bei gewalttätigen Auseinandersetzungen, Unfallopfer oder Feinde sind läßt sich heute nicht mehr endgültig klären.